The Itumeleng Petra Diamonds Employee Trust (IPDET) is a registered trust, which holds a 12% interest in each of Petra’s South African operations, through which the current and certain former employees (with some exceptions in both cases) of Petra’s South African operations participate. 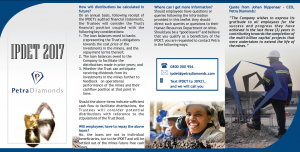 If you worked for Petra Diamonds in South Africa for a period of at least 12 months and left the Company due to retrenchment or retirement since 1 July 2008, then you may qualify as a beneficiary of the IPDET. Download more information here or reply IPDET to 30921 (free reply from a South African mobile number) or call 0800 000 0956 (toll-free from a South African landline) for information. The IPDET is one of Petra’s black economic empowerment partners and therefore holds a direct ownership in the Company’s South African operations. This provides the opportunity for all of Petra’s South African employees to directly share in the successful development of the mine in which they work. The IPDET commenced making annual distributions to its beneficiaries in December 2014. These distributions are expected to grow over time based on the improving profitability profile of the Company’s mines. Employee distributions from the IPDET aim to be a compelling motivator to drive enhanced employee productivity and accountability.